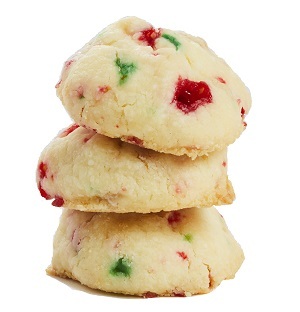 Tender shortbread speckled with peppermint candy and white chocolate chips. INGREDIENTS: Butter, wheat flour, corn starch, white chocolate (sugar, milk ingredients, cocoa butter, soy lecithin, vanilla extract), icing sugar, candy cane pieces (sugar, glucose syrup, natural flavour, colour (contains tartrazine), glycerin, canola oil, sunflower lecithin), natural flavour. Where in the world can I get these cookies? Give us something to chew on - send us a message!